Chapter 12: Is is Really Better To Give Than Receive? Couponers are generous people. They develop their shopping super powers and stock up on all sort of good stuff. After they’ve built their stockpile it’s not uncommon for them to donate and help others out. However, sometimes these good intentions can become problems if taken too far. Enter the coupon gift basket. 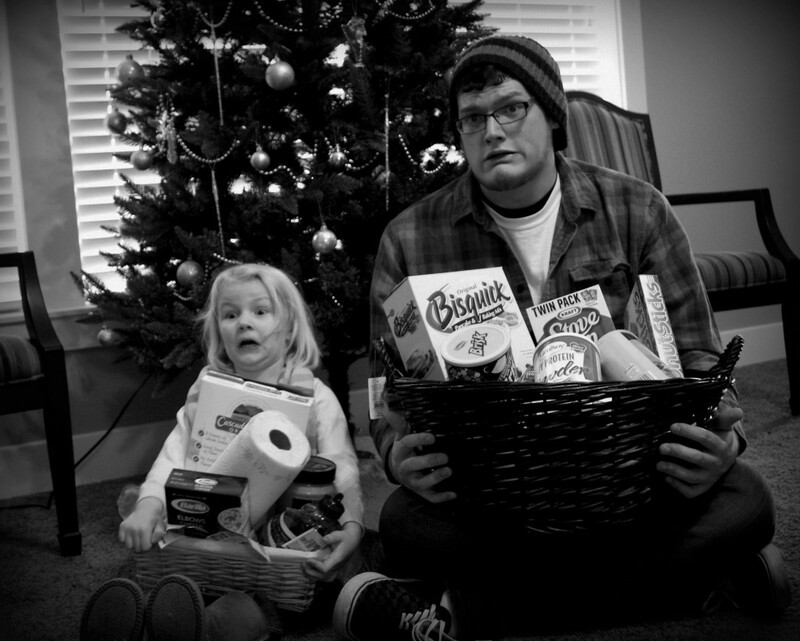 During the couponers infant stage of development they’re often driven mad to collect free stuff. The end result is usually more items than they will ever use in their lifetime. I’m talking to all the wives who brought home 50 shampoo bottles for their bald husbands and 100 toothbrushes for their two kids. Once the coupon lust has ended and they realize they may have gone a little too far they look at their piles and think of ways to trim it down. I have observed that this is done in two ways. First, they will donate to local charities. The second is the infamous coupon gift basket to family and friends. These gift baskets are usually an assortment of toiletries and household foods. My wife thinks that someone getting this kind of gift basket will think “Oh look at all these great items, now I won’t have to spend money on deodorant or toothpaste for a month. ” However what this gift basket really says to the recipient is “I like you but you’re stinky, hairy, unwashed, and need to brush your teeth.” Most people who receive these baskets usually have the same look on their faces when they were younger and received underwear for Christmas as a kid. They usually smile and then say something about how they could really use a few more of these but deep down they really were hoping for some of those free chocolate bars you bragged about last week. Learning to give is important and the right thing to do but it must be tempered. I would never give my wife an exercise video because I know she would probably dispose of me in one of the dumpsters she frequently dives every month. So why give your neighbor a pack of razors and some newly scented deodorant? (unless they really are hygienically challenged). The important thing is to give the coupon gift basket to the right people at the right time. For instance, college students love this type of gift basket. They are neither insulted-because they are smelly and unwashed-or disappointed because they usually are poor. I have often cautioned my wife to use her coupon super powers only for the good of mankind. So next time your spouse is looking over her stockpile of goodies and feeling generous, try to suggest a few fun things for the basket and then your neighbors might start answering the door again when they see you coming. So… I am a couponer but not to the Extreme. My skin is not thick enough yet. I stumpled across your stories and I just laughed for the last 20 minutes. Very well written. You sound just like my husband. I love that you appreciate everything your wife does but you are still a man and laugh at the whole situation! Awesome. Can’t wait for the next chapter. So funny. My favorite one of this series is the Triple Lindy one, I am still thinking about how funny it is. Oh my goodness, I don’t know if I should admit this or not, but I have been guilty of this as well. It is fun to get rid of stuff that you think others will like though. Thanks for this fun series, I have read them all and LOVE them.